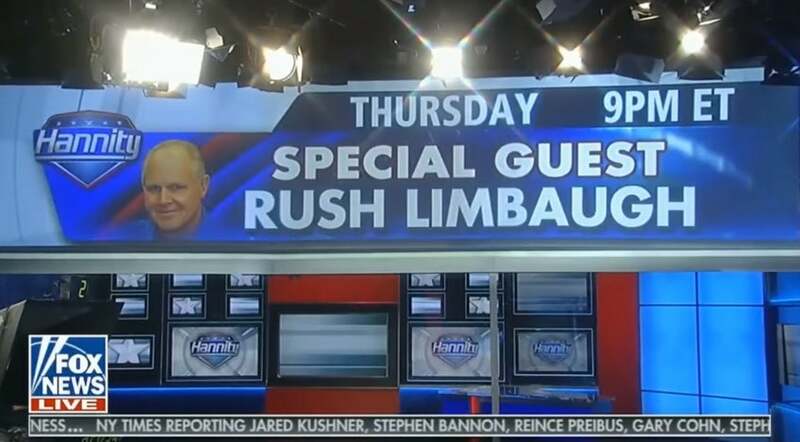 RUSH: I’m gonna be on Fox News, Sean Hannity tomorrow night and Friday night. They’re coming in here tomorrow morning. We’re gonna tape the interview before the program tomorrow. And Snerdley, guess who’s coming down? The commie babe makeup artist is coming. They’re bringing Debra. Debra has asked to come. The commie babe that did my makeup at Rush Limbaugh the TV show back in 1992 to 1996, when that ended and Fox started up, she went over there. And now she’s makeup supervisor, vice president makeup supervisor, but she’s gonna come down here and actually do the makeup. Her name is Debra and she’s a kick. And my niece Christen works on the Hannity show. She’s coming. So we’re gonna have loads of people in here. What time are they coming in to set up? Right. That’s what I thought, before the sun comes up. That’s television.